I am not ashamed to say that I am an avid airline/hotel points collector. In the last three years, I’ve flown over 120,000 miles of leisure travel without paying a dime for hotel or airfare. My wife and I lived apart for 4 months in 2012 and I or she flew from DC to San Diego every other week for free. I just checked my awardwallet.com account and I’m sitting on 650,000 miles/points in my collection of accounts. So, other than Padres baseball, if there’s one thing I adore as a hobby, it’s point collecting. For this reason, it piqued my interest when the live tweets coming out of this past Sunday’s Padres Social Summit (which Wayne Partello and the Padres marketing crew rudely did not invite me to) reported that the Compadres Club rewards program would be back next season. I know Gaslamp Ball has long been pushing for a return of the Compadres Club. It was so exciting to scan your Compadres Club card back at Jack Murphy, save up points, and then win some swag, so I’m glad to see it returning as a full fledged program. But to those not in the know, Compadres Club actually made its return for the 2014 season, just limited to season ticket holders. One of the most critical issues for any points collector is fully analyzing the “earning and burning” structure of the points economy. It may be very easy to earn points, but if they are difficult to redeem for value, then all it does is display inflationary tendencies (like money! ), Similarly, it could be very difficult to earn points, but redemptions could be at low point prices, making it a bit more balanced. I’d like to take a look at the current economy created under the season ticket holder Compadres Club program, as I believe it is a good indicator of what behaviors the Padres are deciding to incentivize, which should carry over to the full-on rollout of the program next season. As you can see, reward points are heavily weighted towards rewarding season ticket holders having premium and full season ticket packages. It also heavily weights seniority as a season ticket holder. For instance, if I were to be a full season ticket holder of 10 years, I start the season with 3,500 points. As a point of comparison, I’d earn 10 points for spending $10 using the Padres e-cash loaded on my season ticket holder card. I would need to spend $3,500 on concessions to equal the number of points I’d earn by buying a $1,000 upper deck season ticket package. 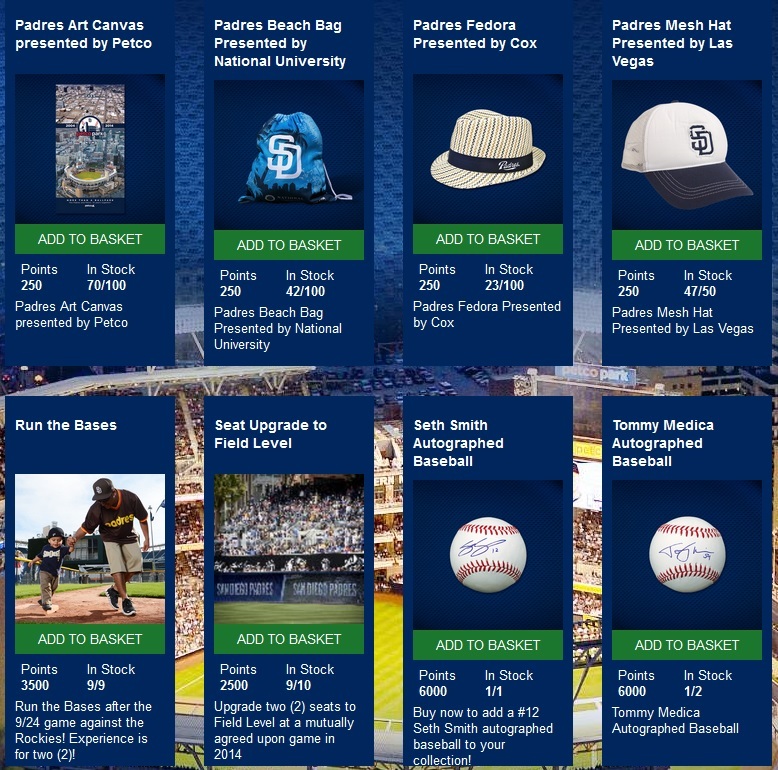 So, it appears that the Padres are heavily incentivizing “membership” over marginal spend at the concessions, as well as interaction via social media (At the Ballpark App for instance). If you consider the team has a season ticket holder base of 10,000, and let’s say that 2,500 of those are full season packages, from day 1, 2,500 people are holding at the very least, 2,600 points in the program. 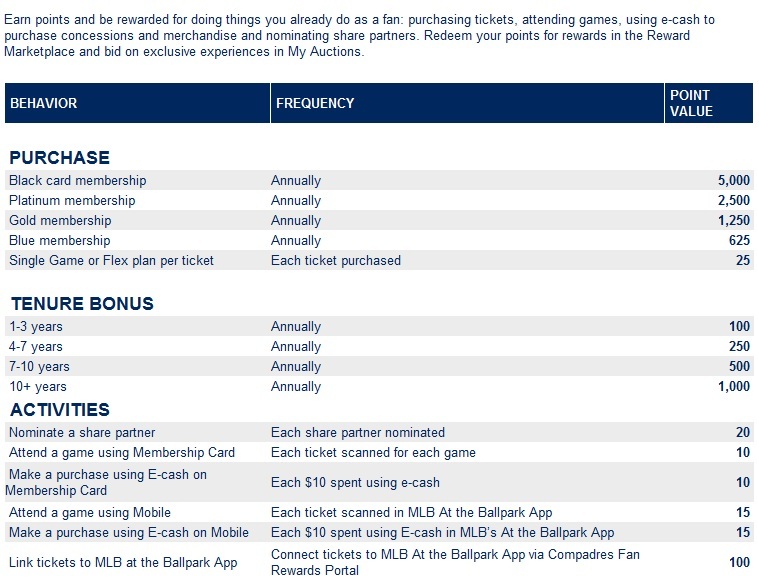 You, the casual fan, who is hoping to earn points and redeem them for experiences/prizes, is starting from zero, and will begin accumulating points via ballpark spend, check-ins and one time bonuses related to linking your mlb.com account to your Compadres Club account. It’s a steep mountain to climb. But it shouldn’t be problem, assuming there are plenty of redemptions that you can earn on the low end of redemption prices. 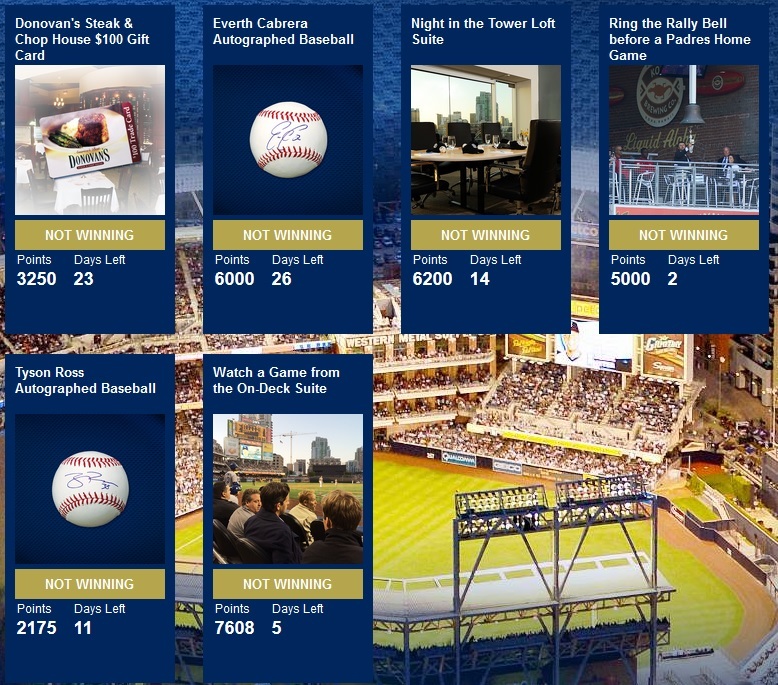 As you can see, the starting point to even get into one of the auctions is 2,175 points for a Tyson Ross autographed baseball, which still has 11 days left on it. That is the equivalent of $2,180 spend on ball park concessions to be able to enter a bid on that item. Most of the other items are being bid upwards of $5,000, meaning it is essentially out of reach for anyone but multiple seat 81 game package season ticket holders. For the average point collector, even for the biggest glutton of ballpark food and craft beer out there, these auctions are an impossibility to win. It should be noted that as in any economy, all of the millions of points that were “printed” at the start of the season have just been sitting there without enough auctions/redemptions to spend them on. This leads to people being able to, especially as the season is winding down and spending options are dwindling, to throw big points at the remaining auctions. A classic example of macroeconomic inflationary pressures. As with the auctions, many of the items, specifically the autographed balls at 6,000 points are out of reach for any non-multiple seat season ticket holder. The run the bases experience and field level upgrade prizes are likely also out of reach as well for the casual point collector. The only truly accessible rewards/auctions are the leftover promotional items being offered at 250 points each. And you can see from the inventories that those items have been moving. Even totaling all of those items that have been redeemed for, only 42,000 points have been redeemed in total for those promotional items; meaning a TON of points that were minted are still out there, ready to be used, inflating the points economy. One other bit of minutiae for next year’s program. The current Compadres Club participants (the season ticket holders) will have 1/2 of their remaining balance roll over to next year’s program. That is a lot of points (millions) that will be in the points economy before you, the casual points collector, even gets a crack at accruing your first point. This will make winning auctions impossible. What does this all mean? There have been drastic inflationary pressures on the current points due to the Padres not offering up enough redemptions. After minting millions of Compadres Club points, throwing 6 or 7 auctions up there every month, with each going for about 5-7k points is not enough to absorb all of those points out there in the economy. To truly make the program of value to the fans, and to promote fan loyalty, which is the core principle behind every points program, the Padres will need to put a lot more time, attention and value into creating redemptions in more quantity, varying tiers of quality to allow for more lower points level spending, and possibly greatly increasing the number of points you can accrue through ballpark spend, game attendance, social media interaction, etc. to counteract the hugely unbalanced number of points that season ticket holders both accrue and will have roll over to next year’s account. It may be that the Padres would rather place the majority incentives towards those higher revenue customers. That’s fine, and it’s a business decision I’m sure Wayne Partello and the marketing team have studied in a cost benefit analysis, but it will totally destroy any value this program has for the casual fan that is not a season ticket holder. Sure redeeming points for a fedora for 250 points provides some value to the fans, but by making the marquee items/experiences, the real carrot to even try collecting the points in the first place, out of reach for most fans, it destroys the motivation to even try and collect the points, relegating the program to another year of being the playground for the “Have’s” that were granted huge sums of points at the season’s beginning. 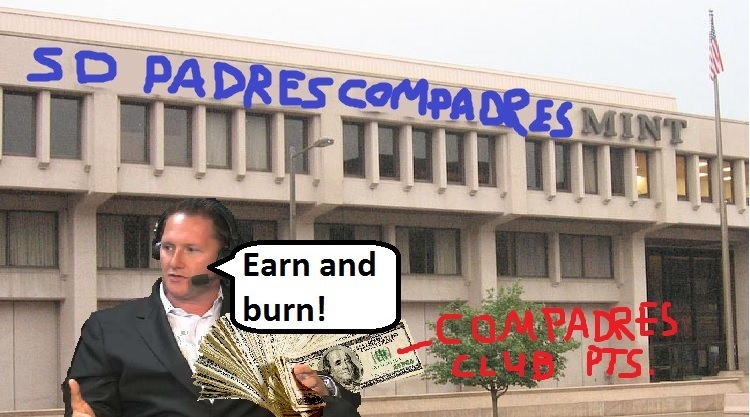 I will be eagerly awaiting the earn/burn structure for the new Compadres Club, although I have my doubts we’ll see it before 2015 Spring Training. Hopefully the Padres can restructure the program into a format that is rewarding for all fans, not just premium seat season ticket holders and other tiers of season ticket holder “members”. While I consider the 2014 Compadres Club points economy to be an outright inflationary failure, there is still time to repair and rescue the program before the big 2015 rollout.